This boiler is similar to the earlier Baxi Barcelona which had the same boiler fault. As far as we can see, the Potterton Promax is a clone of this boiler so it applies to the Promax boiler too. Frustratingly, this Baxi 100 HE boiler only locked out intermittently, making it difficult to find the fault. Only when the lock-out problem became more frequent were we able to pin it down. We rang the Baxi Technical help line 0844 711525. They suggested that this could be caused by a problem with the old-style condensate trap. It's easy to determine which condensate trap is fitted, and this applies to the Baxi Barcelona boiler too, which used the same condensate trap. The earlier trap is much shorter than the new trap, only about half the height of the available gap at the bottom of the boiler. The photo below shows the condensate trap (sometimes called the condense trap) to the left of the fan. That's an old condensate trap. The new trap is half as tall again. As a safety mechanism, to prove that the condensate pipework has not become blocked, two electrical terminals are fitted into a "well" on the top of the condensate trap. A connection from the flame rectification circuit is made to one terminal and the other terminal is connected to earth. 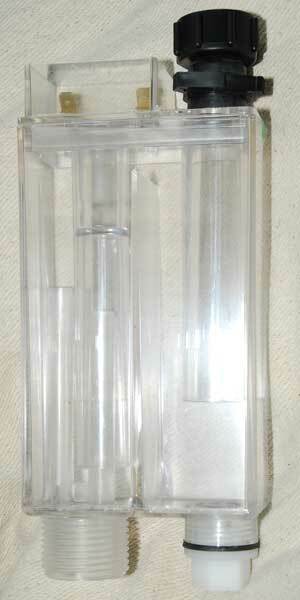 The well on top of the trap is deeper and the hole through which the condensate passes into the well is much smaller. This keeps the area between the electrical contacts drier and cleaner, helping to prevent nuisance leakage of the flame rectification current to earth. 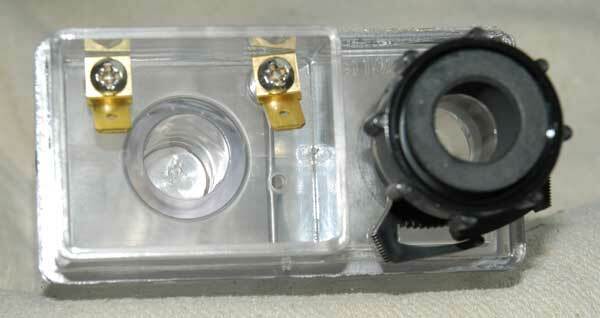 The small hole is visible directly below the right hand electrical contact in the photo below. We fitted a replacement, new-style, condensate trap. It's a bit of a tight fit but we followed the instructions that came with it and it worked. It's important to fit the black screwed connection to the boiler sump before connecting to the condensate trap. If you connect it to the trap first it becomes very difficult to connect the black screwed connection without cross-threading it. With new new condensate trap fitted the boiler worked perfectly. This should also apply to the Baxi Barcelona boiler, which used the same "early" condensate trap and which should accept the new condensate trap. Potterton Promax boilers appear to carry the later, taller condensate trap. If the condensate drain pipe or the trap become blocked, a small hole in the bottom of the well allows condensate to pass up into the well, making an electrical connection between the contacts, allowing the flame rectification current to leak to earth. This shuts the boiler down. 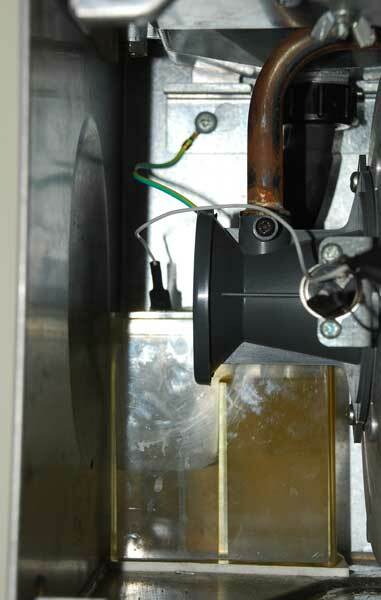 The problem occurs when moisture or contamination between the terminals is present even when there is no blockage in the condensate trap or pipework. This causes the boiler to lock out. The new trap in the photos below is much taller, keeping the electrical terminals further from the condensate. If your Baxi 100 HE boiler (or your Baxi Barcelona or Potterton Promax boiler) keeps locking out, first check if the condensate trap is over-full. If the condensate waste pipe is blocked or frozen, or if the trap itself is blocked, the trap won't be able to empty and this will be shutting the boiler down correctly. If the trap and condensate pipe are not blocked or frozen, try temporarily disconnecting either the earthing lead from the trap or the white lead (making sure the white lead does not earth out). Try running the boiler with the lead disconnected. If the boiler runs correctly try re-connecting the lead. We disconnected the lead and the boiler ran normally. With the lead re-connected the boiler locked out. We repeated this process to be sure. The Baxi 100 HE boiler locked out each time the lead was re-connected but not with it disconnected.